If you're like me, one look and you think, "What in the world is that thing?" or "It's a freakin' TV remote control!" or "What am I supposed to do with that?" It's actually a next-generation video game controller by Nintendo. The idea is that you hold it in your hand, wave it around in the air like a magic wand...and the game responds to you movements! Cool! But does it really work? It is essentially a wireless, square remote that works something like a computer mouse would in 3D space. Imagine sticking your hand into a virtual box and having your TV understand how it's moving in there. Now you're getting the idea. 3D Pointing. Sensors understand up, down, left, right, forward and backward. Tilt Sensitive. 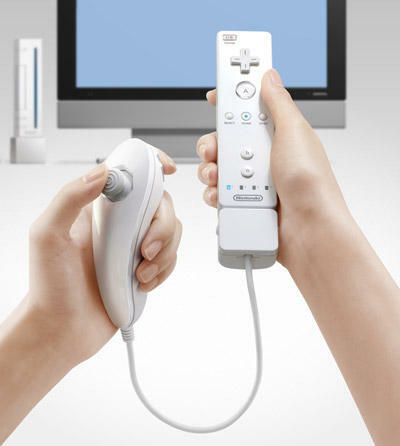 Controller can be rotated or rolled from side-to-side. Buttons Included. Has a trigger on its backside, face buttons, and a D-Pad. Multifunctional. Has an expansion port which can be used with different types of controller peripherals. Analog stick with two trigger buttons planned for left hand. Wireless. Totally wire-free. Currently there are no details on the max distance, source or power, or otherwise. Rumble Built-in. Included as a standard in all the controllers.